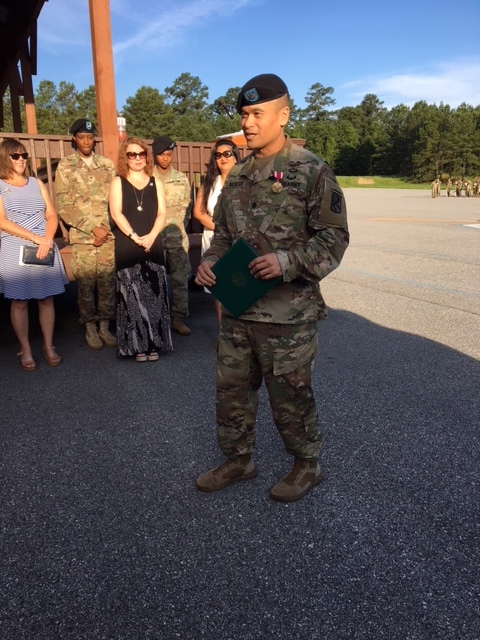 On Monday evening, June 4th, 2018, as has become "tradition", Members of the 50th Infantry Association as well as the outgoing and incoming Battalion Commanders, their Wives and Families....and several other 50th Infantry Cadre gathered for dinner at Hunter's Pub Steakhouse near Fort Benning Georgia. 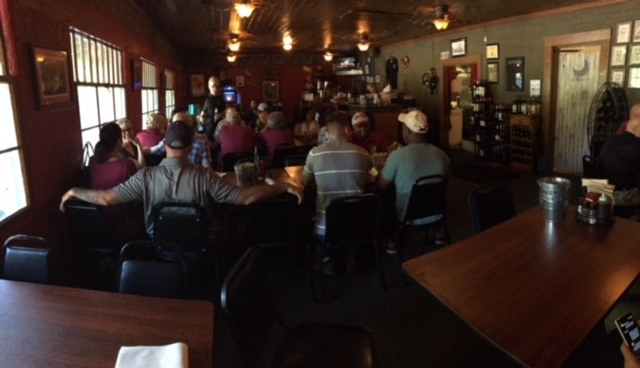 This dinner tradition has grown from about a dozen to this year's approximately 30 attendees! Hunter's pub, normally closed on Monday, opened specifically for our group. 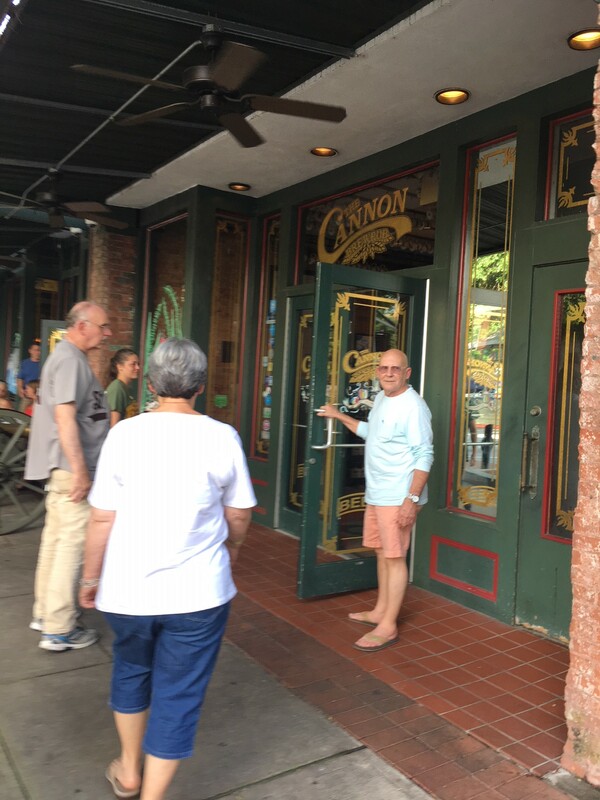 In the photos above (Left to right): Early arrivals Gary, Kris and Kay Quint, Toby and Brenda Jordan and Jim Sheppard went to dinner in Columbus at The Cannon Brew Pub. Monday night dinner guests at Hunter's Pub. 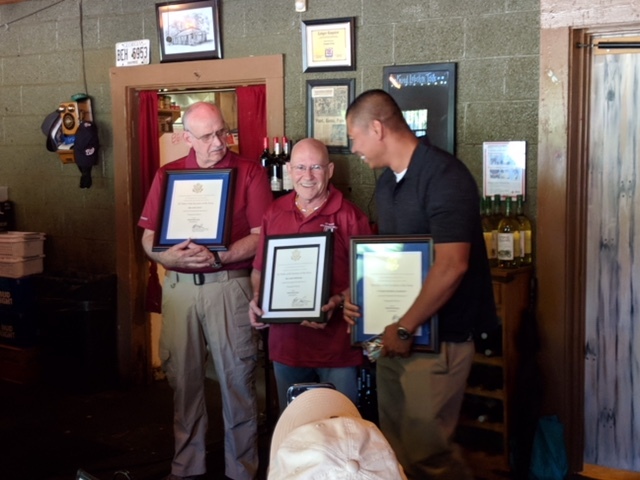 Gary Quint, Jim Sheppard and a member of the 50th Infantry Cadre are presented with "Distinguished Member of the 50th Infantry Regiment" certificates from the Department of the Army. 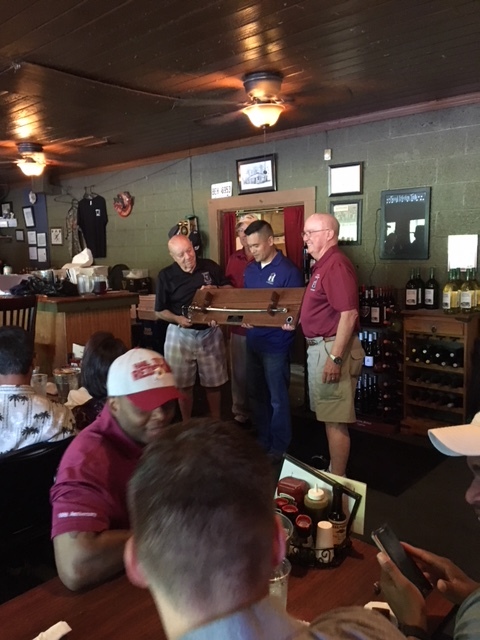 Lastly, Honorary CSM and Colonel of the Regiment Jay Copley and John Topper flank LTC Baltazar who holds the Saber they presented him as a gift in appreciation of his service to the Battalion and our Association. 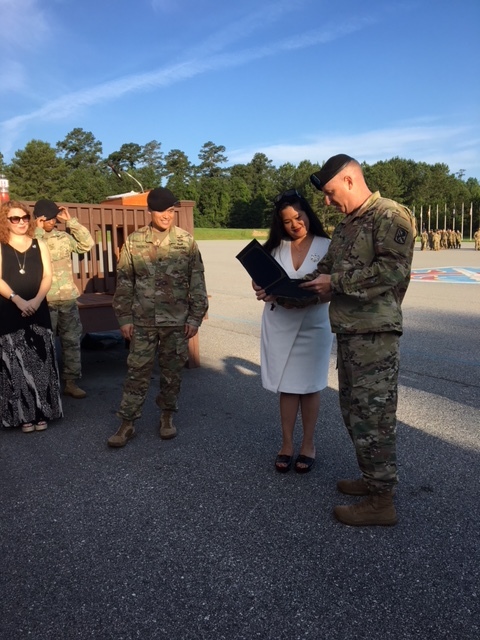 In the photos above (Left to right): Audrey Baltazar,the wife of Outgoing Commander LTC Frank Baltazar Receives an award from the 198th Infantry Brigade Commander COL Kelly Kendrick. LTC Frank Baltazar gives key attendees and personal "Thank you" and preview of his upcoming fairwell message. 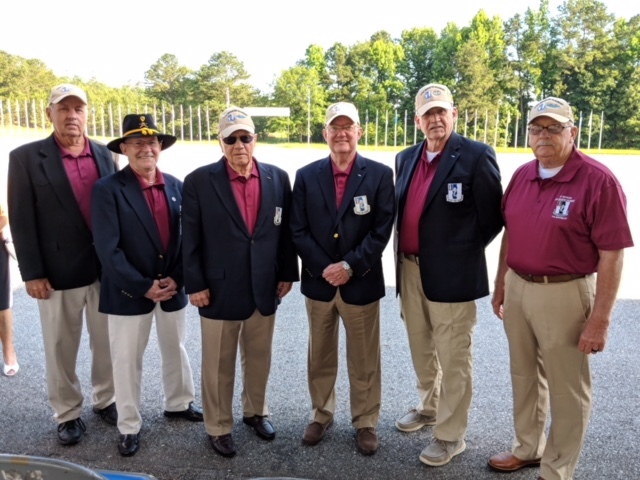 Lastly, 50th Infantry Association Officers in attendance: President Jimmie Segars, Historian Jim Sheppard, Honorary CSM of the Regiment Jay Copley, Honorary Colonel of the Regiment John Topper, Secretary Gary Quint and Chaplain Toby Jordan. 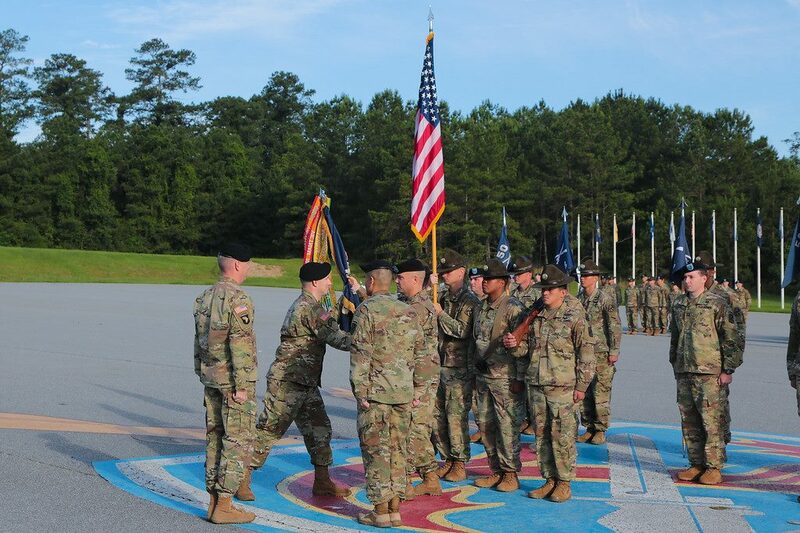 Tuesday Morning, LTC Brendan Gallagher accepts the 50th Infantry Regimental Colors from CSM Christopher Lewis as the 198th Infantry Brigade Commander COL Kelly Kendrick and outgoing Commander Franklin Baltazar look on. LTC Brendan Gallagher is a native of Columbia, MD. He was commissioned as an Infantry officer via ROTC at Johns Hopkins University in 2001. 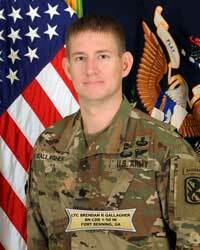 LTC Gallagher attended the Infantry Officer Basic Course and Ranger School in 2001. His first assignment was as a rifle platoon leader and then company XO in B Co, 1-506th Infantry Regiment, Camp Greaves, Korea. In 2003, he was assigned to C Co, 3rd Ranger Battalion where he served as platoon leader and deployed to Iraq and Afghanistan. In 2005, he attended the Infantry Captains Career Course where he was recognized as distinguished honor graduate. He was next assigned to 1-5 CAV, 2ABCT, 1st Cavalry Division at Fort Hood, TX in 2006 where he served as Battalion Assistant S-3, and then assumed command of B Co for the majority of a 15-month deployment to Baghdad during the Iraq surge. He was then assigned to the 75th Ranger Regiment in early 2009 where he served as LNO and Regimental Assistant S-3, prior to assuming command of Regimental HHC and deploying multiple times to Afghanistan. From 2011-2012 he attended the Army Command and General Staff College at Fort Leavenworth, KS, where he received the Marshall award as the distinguished graduate. He was next assigned to 6-4 CAV, 3IBCT, 1st Infantry Division, where he served as Squadron S3, and then served as Brigade XO during a 9-month deployment to Afghanistan. Following redeployment, he was selected for the Advanced Strategic Planning and Policy Program (ASP3) and conducted doctoral studies at Princeton. In 2017 he was assigned to the Commander’s Action Group at the Maneuver Center of Excellence at Fort Benning, GA, and later served as XO to the Commanding General. Lieutenant Colonel Gallagher’s awards and decorations include the Bronze Star Medal w/2OLC, Meritorious Service Medal w/2OLC, Combat Infantryman’s Badge, Expert Infantryman’s Badge, Master Parachutist Badge, Pathfinder Badge, Air Assault Badge, German Armed Forces Proficiency Badge, and the Ranger Tab. He holds a B.A. and M.A. in International Relations from Johns Hopkins, and an M.A. and Ph.D. in Public Affairs from Princeton. LTC Gallagher is married to the former Elizabeth Tatum and they have three children, Ethan (7), Megan (4), and Nolan (7 months).